The 2014 Winter Olympics begin Feb. 7 and will be taking place in Sochi, Russia. Celebrate this quadrennial event with Olympics-theme worksheets: coloring pages, word searches, math worksheets, and more. 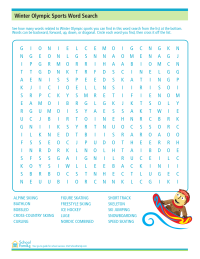 Winter Olympic sports-themed word search. Can you find all the sports' names in this word search? 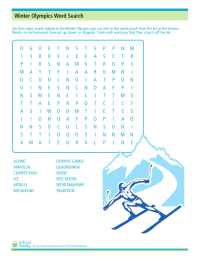 Find Winter Olympics-related words in this themed word search. 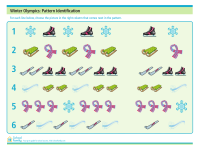 Practice identifying patterns, an early math skill, with this Winter Olympics-themed math worksheet. 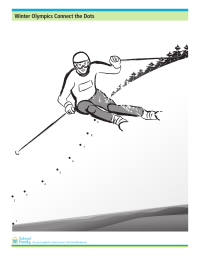 Practice multiplying by two with this Winter Olympics-themed math worksheet.